I have been researching and reading about Robotic Process Automation since 2014. In this rpa tutorial I’m going to explain all my understanding and researches about RPA in a layman’s language. So that even the beginners who reads this tutorial will get a clear understanding about RPA basics. “robots are going to do the computer based tasks which are now performed by humans”. When I say robots are going to do the human tasks that doesn’t mean physical robots are going to sit infront of the computer and do the tasks, it means a software application that will replicate the actions or tasks exactly the way how a human does. 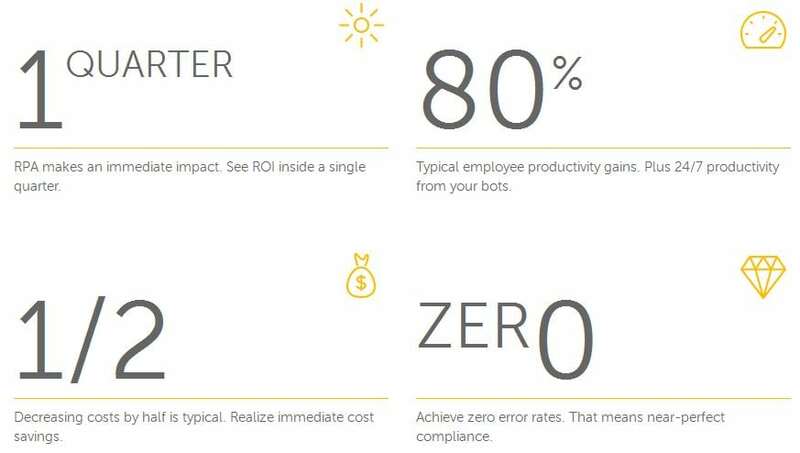 RPA will automate low value clerical activities performed by humans. Most importantly RPA is only for clerical process automation and not for all human activities. Now this would have suddenly rang a bell – humans are going to lose jobs!?? Ofcourse there will be some changes in the way how we have been working so far. RPA is going to open up new opportunities for human workers. 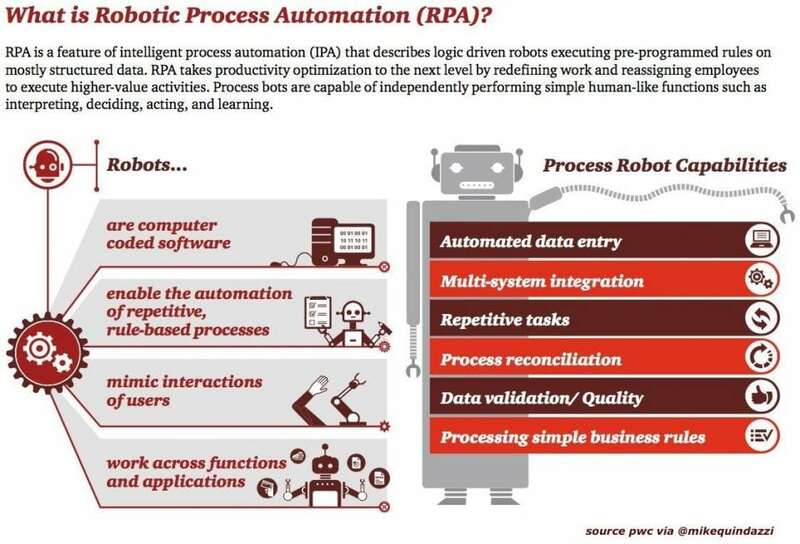 Robotic Process Automation is a way of Artificial Intelligent workers performing the tasks. We should be smart enough to find those new opportunities and prepare ourselves to grab it as and when it arises (Infact now is that right time). When a job gets monotonous people lose interest but not robots!, then why do humans have to do those monotonous, low value adding, repetitive jobs? Humans can do much better interesting jobs! When something is delivered without interest, chance are more for errors. In case of robots, there is no such complications as robots don’t have interests unlike humans. To avoid human errors and to reduce human efforts. To saves time and improve productivity, accuracy and consistency. Enhance the business analytics and easy standardization of workflow. To have a frictionless delivery of tasks. Complete Audit trail for any kind of compliance purposes. Ok! now think it in this way, when computers were introduced there were objections from many group of people around world. People were saying “computers are going to take away the human jobs” but was it so?? One of the biggest revolutions that has ever happened in the history was ‘Books to Computers’. Now I don’t have to explain anything more about the billions of opportunities computers created. How computers have changed the word! People who were smart and fast enough to adapt to computers, grabbed the opportunities while others were busy protesting. Microsoft Excel has been a fantabulous application and it’s a bread and butter for millions of people around the world. But in excel also people does monotonous, low value adding, repetitive jobs, so whats next?? Some people were smart enough even there too, found opportunities for automation and simplification. They learned more about Excel formulas, Macros, VBA etc. and grabbed those opportunities. They got paid well and grew in their career (me too have the similar experience) while others were still struggling with untidy monotonous jobs in Excel. So what I’m trying to make you understand is Robotic Process Automation is one such golden opportunity! Now lets come out of that era of Excel Formulas, Macros and VBA, world has gone further from there! For example who likes to sit and process 100s of invoices everyday throughout their life?? No-one right!! So whats next?? RPA is going to be that change. Robots will do those kind of jobs exactly the way how a human does. That’s why I was saying don’t worry it’s not you and me going to lose the job; it’s a bell ringing for people who are tired of doing monotonous clerical jobs. Its time for them to prepare themselves for the new opportunities. So now you might be thinking what are those new opportunities that I keep saying and how to find those opportunities. Then how does RPA work? – RPA works using Demonstrative Steps. As I mentioned above it’s a way of Artificial Intelligent or rather, virtual workers performing the activities as exactly as human does. Lets take a business process example, when a new joiner comes in the team how he/she gets trained to do a task, the same way these virtual workers also need to be trained step by step. Who are the best people to train the new joiner? ofcourse not the IT engineers! Its the SMEs and Process Experts. Similarly the best people to train the RPA robots are also the Business operations people. The subject matter experts and the process experts. 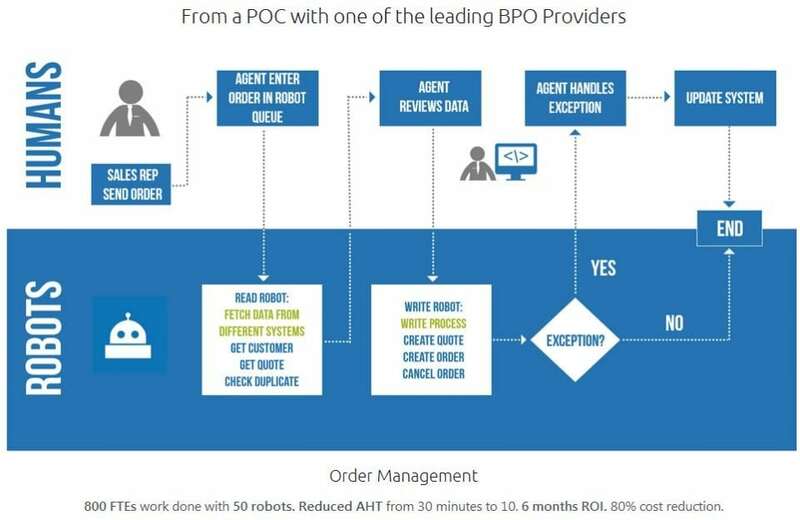 Below is an example of how Robotic Process Automation works in an Order Management Process. Process experts with no programming skill can become RPA experts in few weeks. As per studies, few weeks of training on RPA tools can make operations people to independently automate process. Below are some of the leading Robotic Process Automation vendors providing the RPA tools to automate the processes. The term Robotic Process Automation was invented by Blue Prism, that itself proves they are the pioneers in Robotic Process Automation software development. Blue Prism has been recognized by the American IT research and advisory company Gartner, Inc. They already have more than 100 customers around the world and partnered with biggest giants like NHS, Accenture, Hexaware, Hewlett Packard Enterprise, Capgemini, IBM etc. Highly recommended to download the Free Brochure on Blue Prism product overview. They are one of the most leading RPA vendors in the industry, already providing robotic process automation solutions to companies like SAP, EY, J.P.Morgan, Deloitte, Accenture, Capgemini, BBC etc. 3. AUTOMATION ANYWHERE– Go be great. Automation Anywhere is another top RPA vendors providing powerful and user-friendly robotic process automation tools to automate tasks of any complexity. They are partnered with companies like EMC2, KPMG, Deloitte, Accenture, Genpact, Infosys etc. Softomotive is one of the leading Robotic Process Automation providers offers sharp business solutions, premium support and professional services that organisations need to get the most out of their enterprise automation. They been trusted by more than 6,000 companies worldwide, (Intel, IBM, SIEMENS, Accenture, Vodafone, pwc, Adobe, Xerox, Cognizant etc). Softmotive has been operating for more than 10 years in the software automation market, and they offers the most reliable and scaleable automation solutions, bridging the gap between best-of-breed technology and continuous innovation to deliver true business transformation. They are the same Company created the most powerful and easy to use Desktop Automation Solution – WinAutomation, for individuals and small teams. Revolutionizing the automation market since 2005. Pegasystems is a software company develop strategic applications for sales, marketing, services and operations. They have a wide variety of products designed for different industries like Financial Services, Insurance, Healthcare, Communications, and Government etc. The advantage with Pega’s robotic process automation tool is that, they already have industry leading BPM (Business Process Modeling) platforms and recently acquired OpenSpan RPA software company. Which makes Pega a complete solution, enterprises no longer have to choose between automation vs. digital transformation. Kofax is a leading software company owns the trademark for “First Mile” of customer engagement. They have a Robotic Process Automation and Web Data Integration product called Kofax Kapow. Which is highly scalable and flexible to provide any kind of robotic automation and artificial intelligence capabilities. NICE is a leading RPA solutions providers in the industry having solid 6 customer success stories. Their Free ebook on Robotic Process Automation Case Studies and RPA Infographics provides more insights about the company and RPA. Another pretty straight forward and a new Robotic Process Automation vendor who operates on 3 simple steps automation. Performance audit, Work automation and Technology Transformation. Novayre Solutions is a Spanish software company specialized in software development, integration and automation. They have been providing business intelligence and automation solutions since 2008. Novayre Solutions developed a Robotic Process Automation with a unique name called Jidōka, which means “automation with a human touch” in Japanese. The whole idea behind this RPA tool is to replicate the human behavior using computer applications. WorkFusion is a software company committed to develop AI powered software products to transform the work. Company headquartered on Wall Street in New York city with branches in India, US and Europe. Key concepts or focus are of WorkFusion are Robotic Process Automation, Artificial Intelligence and Cognitive Automation. WorkFusion is already partnered with companies like Deloitte, Cognizant, HCL Technologies, EY, L&T Infotech, TATA, Virtusa, FIS™ and Wipro. Now that we know some of the leading Robotic Process Automation vendors, the next step is to decide which tool to choose. Its a hard decision! since all most all the vendors are providing about similar rpa tools in terms of as an automation solution. First and foremost is the technology in which RPA tool has been built, like Microsift .NET, IBM Mainframe, Java, web etc. The tool has to be platform independent, considering many of the organizations perform their day to day tasks outside the local desktop using Citrix or Virtual machines etc. So the automation solution should be able to support any application and platform. Next most important feature is the RPA tool’s user interface. A complex user interface will delay the process of implementation and increase the learning curve and adaptability. A more user friendly interface like drag and drop, auto capture, image recognition etc. would be better. It is important to know how effectively and easily the robots can be managed considering these robots are going to be replacing your human workforce. There should be a high level of visibility and control in terms of process monitoring, process change, development, re-use etc. I would say security is one of the most important factor to be considered. How safe are the robots when compared to the humans? After all robots/RPA tools are also a piece of software, so how much more security controls can be implemented, test the code rigidly and lock it up, the better. Automation solutions that supports the compliance process (like HIPPA – For Healthcare industry, SOX – Financial Sector, PCI DSS – Credit card related organization etc.) are some of the factors to be considered in terms of security. RPA implementation methodology can be broadly classified into 6 steps. Below are the approach to be followed for a successful RPA implementation. Ramp up and Continue Building Expertise RPA bots. I have written a more detailed article on the RPA implementation approach, you may please check the same. Also you can download the FREE Infographics on the RPA Journey. Any industry that uses computer for monotonous jobs can leverage the benefits of RPA. RPA is making its way into every industry possible, below are some of the RPA adoption by industry and the use of RPA. Use – Customer support, service desk, KYC, Loan processing etc. Use – ERP Automation, Logistics data automation, Invoice processing, web integrated rpa etc. Use – Remove or reduce the lot of paper work by introducing the Virtual Infrastructure. Claims processing, appeals processing, responding partner queries etc. Use – Switch from bunch of papers to making all required documents digitally available in seconds. As of 2017 almost 80% of the industries are already using RPA solutions in one or the other way. You can play the below 2 min video to see the RPA growth % in various industries. Now that we know the industry wide usage of RPA, it is good to know the list of companies which are using RPA. This was a request from many of my readers as well, so I have written a detailed article with the list of companies using RPA. Feel free to check it out! If the below the prerequisites for rpa are not considered properly then chances are high for leading the Robotic Process Automation to a failure. Early implementation of RPA is one of the major reasons why RPA fail. Many organisations and professionals are now in a hurry to implement RPA in their respective areas and get the RPA seal. This hurry can lead to a wrong process selection for automation. A wrong process selection in terms of Complexity, Maturity, Cost-effectiveness etc. will lead the RPA journey to a failure. So to avoid this mistake, it is highly important to strictly follow the RPA Implementation methodology (mentioned earlier), especially step 1 & 2. Operations, IT infrastructure and the RPA vendor/tool are the 3 key factors of RPA journey. Operations – There should be a clear understanding on the process that need to be automated, including the exceptions if possible. This understanding has to be clearly communicated and documented between the operations and the RPA development teams. IT Infrastructure – You can develop an outstanding RPA solution but what if it does not work in your environment. So it is important to have a clear understanding on the infrastructure where the bot has to run. For eg: whether it should be a desktop solution or an inside citrix solution or it’s a published environment etc. Considering all these factors its also important to choose the right RPA tool for the development by strictly following the tool selection checklist. A few years ago it was very difficult to find rpa study materials and institutes to learn RPA, but now the situation has changed. There are lots institutes and websites providing offline and online RPA tutorials and courses, many of them are free as well. Understanding what is RPA is the first and foremost stage in the learning curve and fortunately by reading this tutorial you are done with phase one. All you need to know about RPA is extensively covered here. As an additional reference you can check the courses in Udemy on Robotic Process Automation. In phase two you need to get more familiar with RPA tools and vendors. A question which is asked by most of the beginners are, which is the best rpa tool to learn? Most of the RPA vendors are providing training on their respective tools for free. To start with I would suggest you to go with UiPath as they have a very detailed UiPath RPA Academy which is damn helpful to learn RPA for beginners. 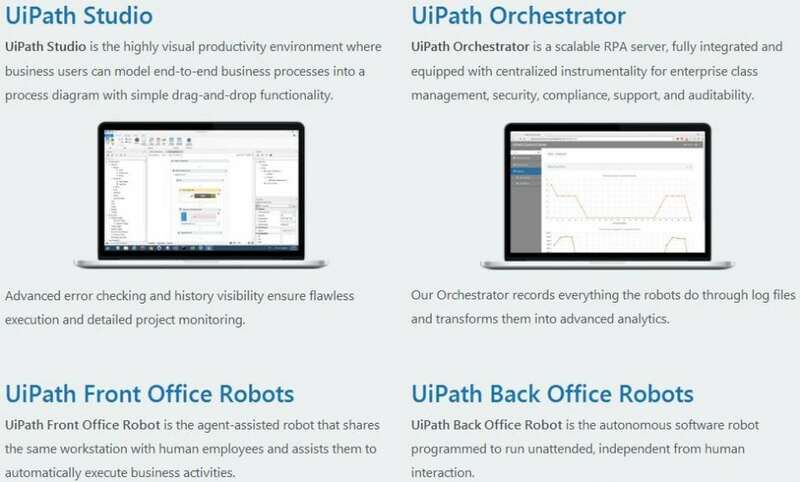 The second and third step should go parallaly, if you decide to start with Uipath then the advantage is they have a Community version of the UiPath software available for free. So while learning with UiPath RPA Academy you also get hand on with the software. There are other vendors also provide free RPA software like RPA Express from WorkFusion etc. Not all vendors provide their RPA tools for free, in such cases joining for a specific rpa certification course will provide you an opportunity to be hands on with those particular rpa tools. Companies and industries follow different job structure and hierarchies however below are some of the common Robotic Process Automation jobs available. RPA BA s are generally the SMEs of the process, it is always better to train the Subject Mater Experts of the process as RPA Business Analysts as they have in-depth knowledge on the process that need to be automated. Process knowledge is very much required for the preparation for process map which will be used during the designing and automation. So if you are a non-techie but a subject matter expert looking for a career shift to RPA then RPA Business Analyst would be a right choice for you. RPA SAs play a key role in characterizing the entire RPA solution by closely working with RPA BAs in the initial stage. They have an important role from defining the RPA solution architecture to successful implementation of the RPA solution. They select the appropriate set of technological tools and features and ensures the alignment of the solution with enterprise guidelines. These are the people who actually develop RPA robots using various RPA Tools. RPA developers are in charge of designing, developing, testing the automation workflows and supporting the implementation of the RPA solution. They work closely with RPA Business Analysts, RPA Solution Architects and the Implementation Engineers. Though it is said RPA is code free, developers with knowledge on programming languages like .net, vba etc. can outshine in this role. These are basically the implementation or infrastructure engineers who gets involved during the implementation of the RPA bot. They might not require the RPA developer knowledge however they should have the infrastructure knowledge like the windows server, citrix etc. and also they should know the implementation process for specific RPA tools in various infrastructure. This is basically the managerial role, who manages or leads the overall automation journey. Resource allocation, performance monitoring, coordinating with various teams, project planning etc. are some of the roles of an RPA supervisor. This can be one of the overlooked RPA jobs but very critical as they are being the primary line of help for the RPA deployment in any organization. Last but not the least, one of the most commonly discussed topic on RPA is Robotic Process Automation Salary. How much does the RPA professionals make annually? Though it is not appropriate to share the salary information, some of the surveys shows that geographic locations has big impact on the annual salary of RPA professionals. North Americans – 68% of the RPA professionals make more than $100K annually. Europeans – 48% of the RPA professionals make $50K to $100K annually. APAC region – 50% of the RPA professionals make less than $50K annually. You can have a quick glance on the Glassdoor website to see some of the RPA jobs and approximate salary offered for each rpa job levels. There are many more topics related to RPA are on the way to be published Subscribe to my Newsletter and be the first one to get notified. We have covered almost all the major topics related to RPA in this beginners tutorial. Please let me know all your questions and thoughts on Robotic Process Automation in the comments section below, I’ll reply to them in the RPA Q & A session. Infrrd AI platform converts unstructured data into structured format & helps RPA customers get more value from their investments. I am Siva Prasad staying in Bangalore, working as a 24/7 support Opreations lead with 10+ years of experience on retail domain(Main frames). As i am lookin for a change in the career towards the futuristic technologies, i have come across RPA through one of my friend. Is it the right choice to shift my career to RPA path at this point of time. It’s really nice overview for a beginner like me in RPA. I am 10 year Test Automation experienced in tools like QTP and Selenium. I would like to learn RPA and change from Testing to RPA. Could you let me know is this the right and relavent move? I am an IT operations guy with 10% knowledge on technology and would like to purse RPA for better career. Am I making a right move ? If so, which one should I prefer? I’m Dennys & want to know is RPA is required any coding skills? Currently I’m working as a Support Engineer & what role in RPA will suit? and finally How is the growth will be in India with RPA skills. Thanks for sharing overview and work process of RPA. Myself Shaik Hussain Pasha, Working as a Software Engineer with .Net Technologies with 3 yrs experience. I have got new opportunities to work with RPA Tools,I don’t know anything about it.I am a completely new for this. I want to know is this new tools help my carrier or shall i continue with same my programming carrier? please let me know dec1 is my joining date. I am technically good in .net,Please let me know…is this good for my carrier? I can get a job related to RPA, but in software development in .NET. I do not know how to start. I am a .NET developer but I do not know any libraries or software component to work with. Can you help me? Awesome , you have given entire view of RPA in this article and thank you very much. Hi Amarnath, There are many RPA tools available in the market, I have made a list of some of the popular rpa tools in this video (https://youtu.be/cpx5dA_5cq4), also people have commented few more tools in the video, you may check out those. Currently I’m doing an analysis on industry vise popularity for different tools which I’ll publish soon, mean while you can also check out the Industry vise growth for RPA (Result: https://youtu.be/UKY46DfeHUM). Based these analysis and your area of interest you can choose a tool which suits for your career growth. Hi I am Renuka and I am a employee of one of BPO. As I am from non-technical background which is BSc in Chemistry and Biology. The fact is i do not know anything about technical field. I heard about the RPA automation which is going to implement or happen in the industry in upcoming days.I am worried about my future, Could you please suggest me or help me out of this so that i can prepare myself for upcoming RPA automation. Thanks for the info Mr Anson. I wanted to learn RPA tools, Can you help me. Many people in the industry feel that Robotic Process Automation is similar to Testing Automation. But it is not so. Let’s look at the differences. 1. Although Robotic Process Automation is a concept where we can use it to automate the tedious task of testing which is done manually and is very time consuming due to its repetitive nature, we can use it across many industries like data entry done in bank. But testing automation can be applied only to a particular product and its features. 2. Test automation works across many environments like QA, UAT, Prod, etc. whereas Robotic Process Automation runs only in the production environment. 3. Test automation is limited to QA whereas Robotic Process Automation systems can be used by anybody in an organization from creation to product usage. 4. Robotic Process Automation can be called a Testing tool but it is more flexible and stable due to its non-coding concepts and it also does not depend on the target system. 5. The testing tools like QTP, Selenium, etc cannot be used as Robotic Process Automation tools because they need a software product to work upon. But Robotic Process Automation cannot be applied to a product.